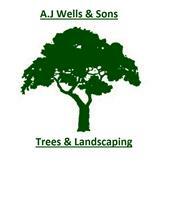 A J Wells & Sons Trees & Landscapes - Fencing/Gates, Garden Services, Landscaper based in Marsh, Buckinghamshire. We have over 30 years experience in the trade. We are a Family Run business and have built our company up on referrals, and our service is second to none. We are in our 4th generation some of our clientele date back 30 years. Over the years we have evolved into all aspects of landscaping. Free Inspections And Quotes - Just call or email and let us know your details and we will book you in at a convenient time at no cost to you. new sheds supplied and fitted.